This project has been with me for ages. About 3 years, to be more precise.. I recall that it started out as a sample. I wanted to try out a new shape in a modular knitting technique, a letter T-shape. 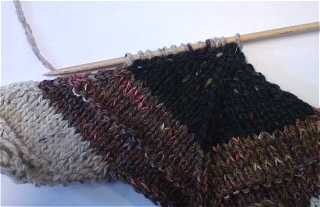 At the same time, the sample served as a test-knit of my handspun yarn out of Silk Hankies. 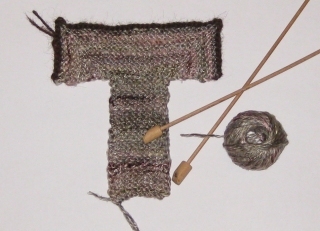 Soon I was hooked on this T-shape and I sketched out a garment with short sleeves and began spinning and knitting. It went well for some time. Then other projects and fabulous ideas came along and had to be delt with. I put my “T-shirt” aside and kind of forgot about it for a very, very long time.. But recently I digged it out, seriously determined to finish it now! There was (is) still some spinning to be done, and a few design issues to be taken care of. I try to keep good notes as I knit along so that there’s a chance that I can write some kind of pattern later on.. With projects like this, that just seems to take shape as you go and is full of surprices, it’s often very difficult to produce a written pattern. In my opinion it’s much more simple to knit modular projects from a drawing/sketch, with som key-numbers and technique-explanations added to it, of course. Let’s see if I’ll be able to whip up a proper written pattern for this baby! This morning I just completed the first shoulder. The lower body, back and front, is almost all done, so now only shoulders and neck shaping remain. Borders too, of course. I’m very pleased with how it turns out so far. The silk Hankies-yarn is nice to work with, and it looks great in simple garter stitch. I’m pretty sure the T-shirt is going to fit (me) nicely and that it will look good with my long brown summerskirt. Can’t wait to get it finished now! I’m off to do some spinning and knitting..
I’ll be giving a few workshops on the technique “Modular Knitting” in May and June. 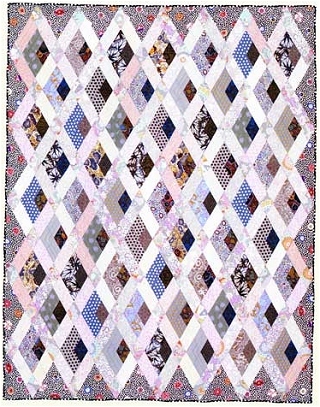 In May it will be on the island of Samsø, at the “Samsø Strik og Quilt-festival”. Follow the link to read more about that fest! In June in Silkeborg there will be a brand new knitting-event: “Grib Garnet”. 4 fabulous days of knitting events, exibitions, and lots and lots of exiting workshops! I have been asked to give two Module Knitting workshops there, and I’m looking very much forward to it! Modular knitting is so much fun. A little bit addicting too. It’s almost like playing with building blocks: one small piece at the time, then just add on, with unlimited possibilities regarding colour, shape and texture. Beautiful, isn’t it? 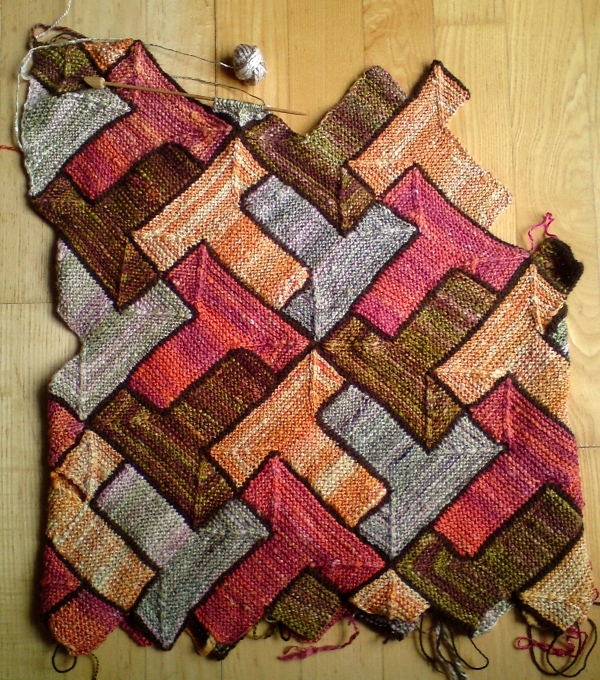 It was a fun challenge to figure out how to knit the trapezoid shapes, and how to arrange the colours. Well. I think it’s time to dig out this jacket-project and get back to working on it. That’s fun! I love sampling. I really enjoy knitting swatches, too. Sampling and swatching are activities so full of anticipation, curiosity, and the results are full of promises of beautiful things to come. Or maybe they are not.. Anyway, is’t an exiting process! 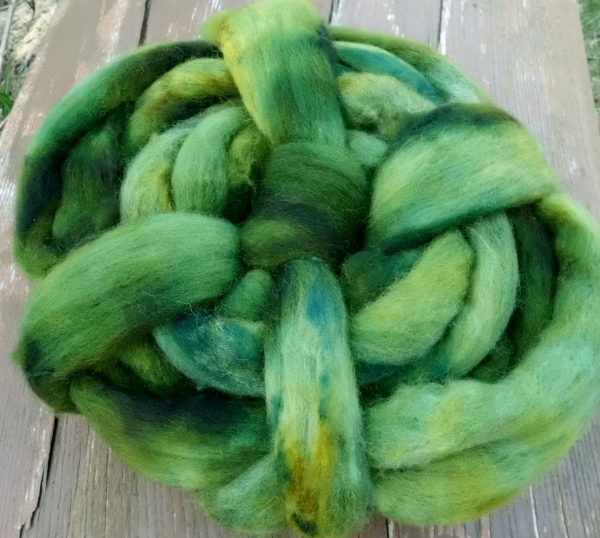 Today I spun a sample of one of my new monochromatic colorways, “Savoy”. A rich, strong, warm green hue. The fiber has both light and dark places, at times almost black. 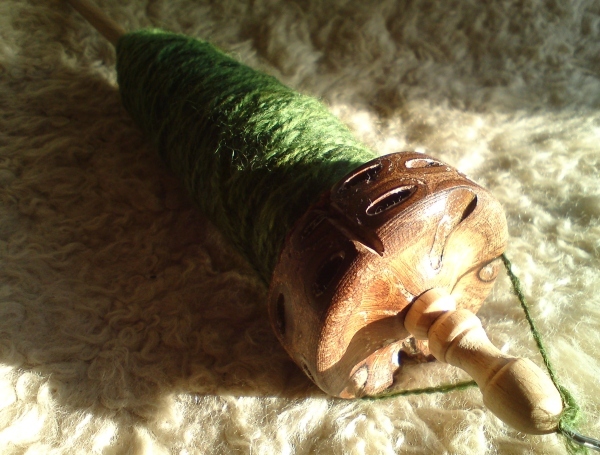 – Now it needs a hot bath (the yarn, not the spindle..) and afterwards I think it will become wristwarmers. By the way, another new colorway is on its way: a deep dark blue.